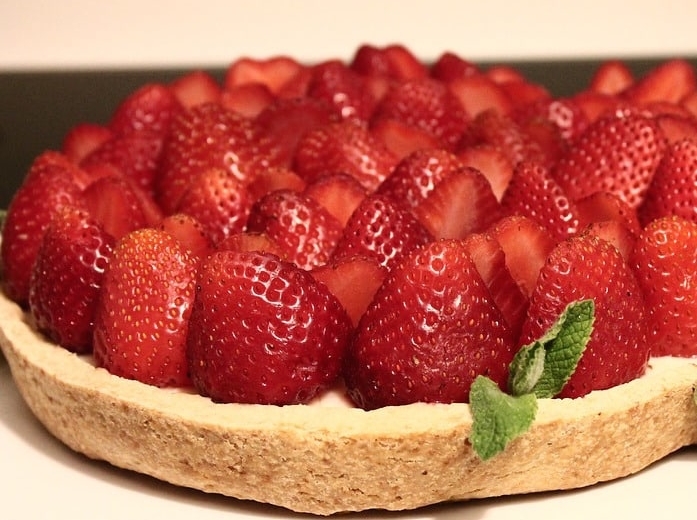 The French prepositions “de” and “à” are both used when talking about prepared foods such as “une tarte aux fraises” and “une confiture de fraises”. Which one to pick actually follows a rather simple logic. All these are different ways of preparing one main ingredient: take away this ingredient, and you’d be left with… spices, sugar… Nothing much at all! This is why we say “une confiture de fraises” = a jelly made of strawberries. Buy À Moi Paris Level 3 and Level 4 Together and Save! You can replace the article by “avec” (with) and it should still make sense. Ok, now this last example is a bit confusing. “Une sauce au caramel”… what else is there in this sauce? More sugar? Some butter? You wouldn’t actually say “une sauce avec du caramel”… So, sometimes, it’s hard to figure out whether you are talking about a way to prepare a main ingredient, or a dish with that ingredient. The best way is to memorize these French subtleties is to learn them in the context of a story, and then rely on what “sounds good”! I highly recommend you check out my unique downloadable French audiobooks, featuring different speeds of recording and enunciation, and focussing on today’s modern glided pronunciation. a, an, one, some, any: the French indefinite and partitive articles. the: the French definite article.